Because fans of lunatic off-road machines with boosted V8s would protest, Mercedes is continuing to update its very old and very awesome G-Class. But to keep it remotely current in today's automotive landscape, the company is reportedly going to redo everything about it – except for the way generally it looks. According to Autoweek, the 2017 G-Class will get dragged further into the 21st century (it dates back to 1979, after all) with everything from a new interior and engines, but also suspension modifications and a weight loss plan targeting several hundred pounds. 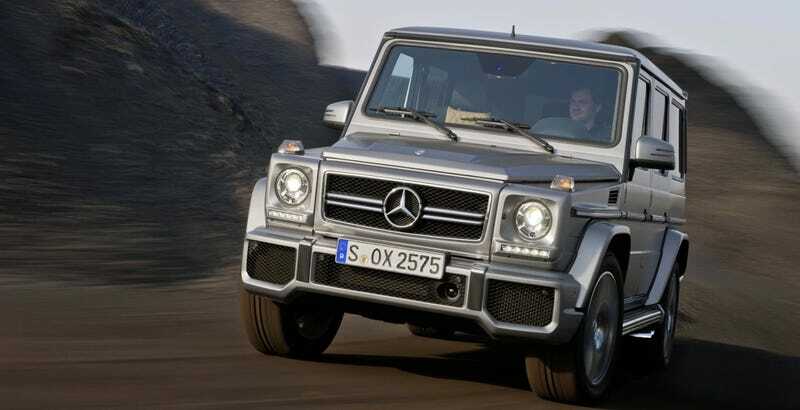 Autoweek's source cites the use of high strength steel and aluminum to help trim as much as 440 pounds off of the G-Wagen, similar to the diet the Range Rover went on. It's also rumored to be made about 4 inches wider, likely for better stability. The electrics are also going to be upgraded in order to offer some of the driver aids available on the new S-Class, as befitting of something that costs upwards of $100,000. Mercedes' new 9-speed automatic is also being added, as well as their most modern engines in order to try and cut more emissions from this thing. Hey, everyone's doing it these days. It'll be interesting to see what this nearly-new G-Wagen looks like when it debuts in the next couple years, and if it's actually a good example of adding modern furnishings to a classic structure.